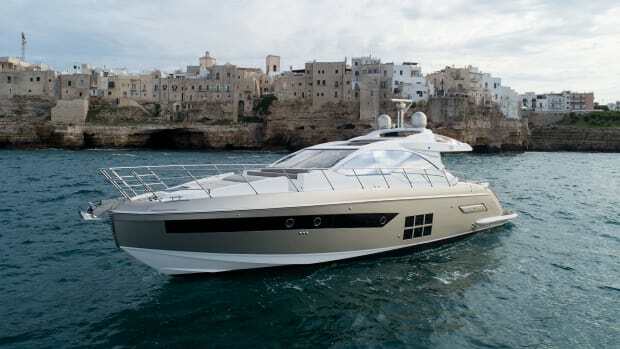 The Ferretti 670 offers high-tech twists and timeless style reflective of the brand’s incremental evolution. 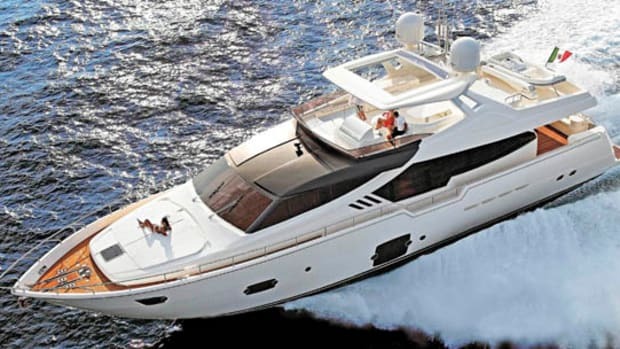 Ferretti has earned a reputation for stability. I’m not talking about the boats’ ability to remain on an even keel—although there are no complaints there—but about the shipyard’s brand image. A Ferretti looks like a Ferretti. Resale values are maintained not just through the quality with which the boats are put together, but through the marque’s instant familiarity. You can tell it’s a Ferretti from across the marina. They don’t seem to age. In design terms, that’s not an easy thing to accomplish. This doesn’t mean the shipyard doesn’t embrace change. 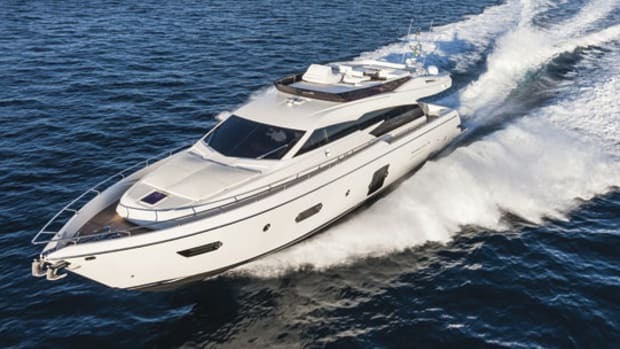 Like Mercedes-Benz, Ferretti seems to prefer to introduce its changes incrementally, so you can usually be confident that in any new yacht you’ll find all the familiar design characteristics of the brand. If you want to see how the design has evolved, you have to go back two or three generations. 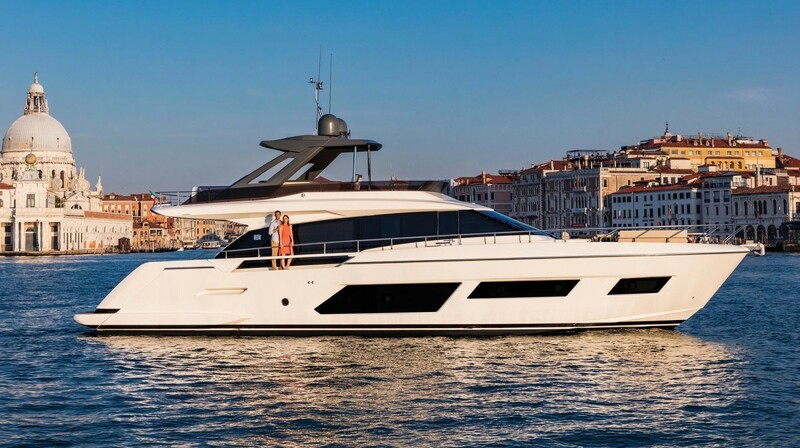 This quiet evolutionary process has been focused on renewing Ferretti’s mid-range yachts over the last few model years, and with the unveiling of the all-new 670 at the Cannes Festival of Yachting, that exercise—for the moment, anyway—is now complete. Somewhat longer, a little wider and considerably heavier, the 670 replaces the 650. It fell to designer Filippo Salvetti to create something new while respecting the old, to refresh the look without detracting from its familiarity. Frightening the horses was not an option. Compare the two yachts in profile, and everything is different. 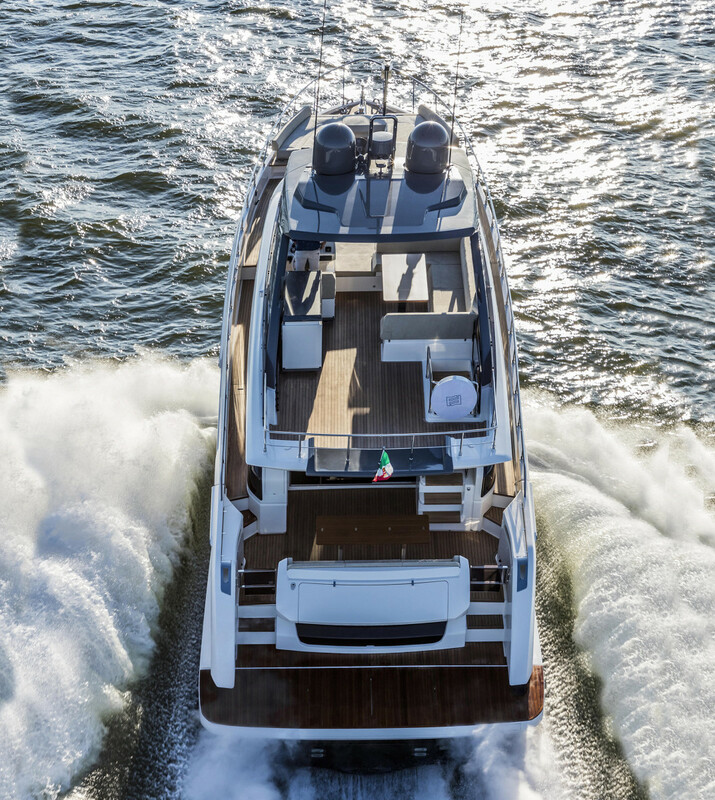 But by paying attention to certain angles—in the transom and hull windows, for example—and to the proportions and visual weight of the superstructure and flybridge, Salvetti has fulfilled the brief. The new yacht is clearly a member of the same family. 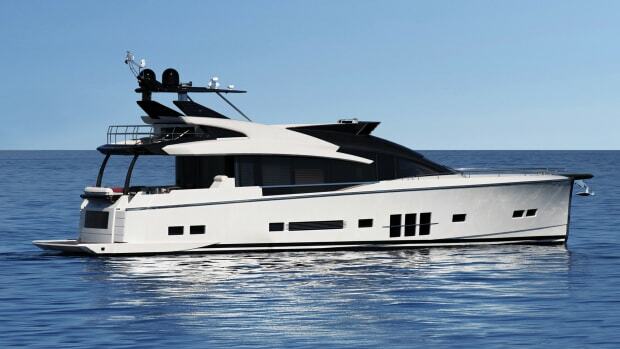 “It is not a revolution,” Salvetti agreed of his first project for Ferretti. 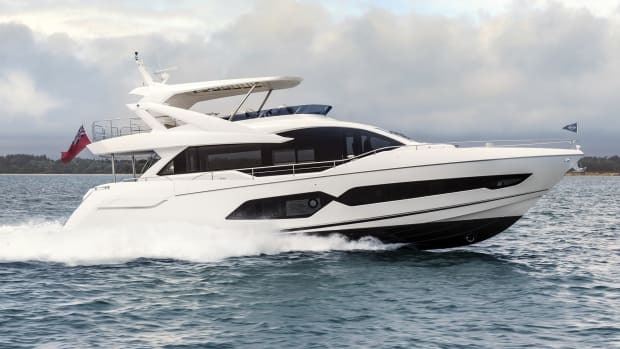 “I studied the brand design history, and added some sharper edges and a more aggressive flybridge profile.” He is perhaps being a little modest. 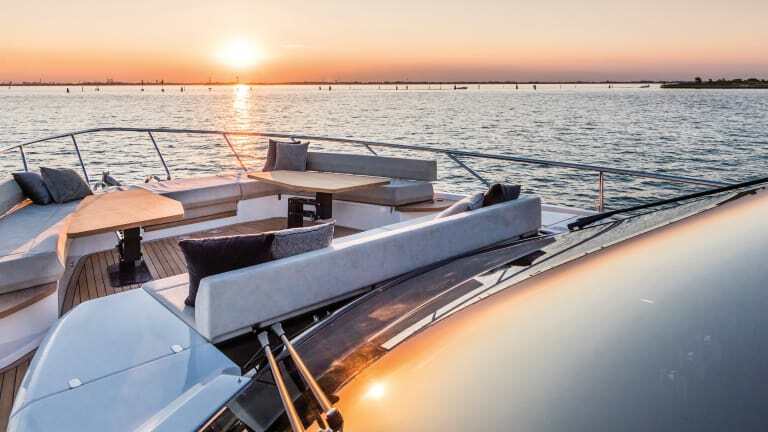 Suitably inspired, Ferretti’s in-house design team has made some significant changes to the main deck layout, placing the galley amidships on the starboard side, just behind the two-seat helm station. This return to tradition makes the best of the 670’s impressive windows, and on fine days creates one large and luxurious living space out of the cockpit and salon. The effect is not necessarily nostalgic, however. The galley, up two steps on the central helm deck, is hidden by a half-height bulkhead but commands the same broad views as those comfortably seated at the attractive dinette on the port side. Its rigorous right angles and dramatic contrasting stripes of walnut veneer hark back not to an earlier Ferretti, but to an earlier design era—the Modernism of the fifties, perhaps. With Ferretti, it&apos;s as much about the hull&apos;s aggressive styling as it is the shipyard&apos;s customary attention to luxe, decorative interiors. 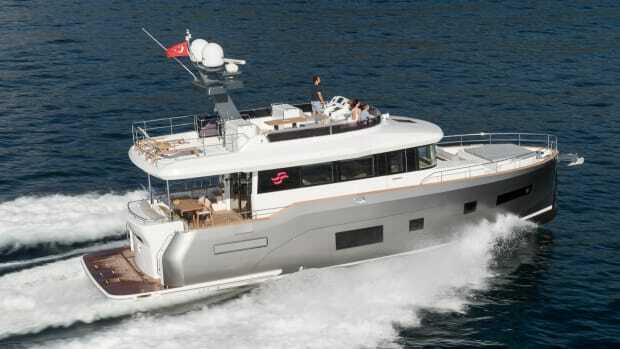 Elsewhere, the interior is fitted out with the shipyard’s customary attention to name-checkable brands. There are fabrics by Zimmer + Rohde, Perennials and Casamance, marble-like surfaces in Florim’s “Calacatta Gold” porcelain, leathers from Lealpell, and furnishings by Dedon and Disenia. Two different decorative schemes are available, described a little disingenuously by Ferretti as light and dark, which address the perceived differences in taste between Eastern and Western markets. Down on the lower deck you can choose between three-and four-cabin layouts, although if you go for the small fourth single cabin you’ll lose the excellent raised office at the entrance to the midships master suite, which with a desk, a chair, some shelves and a simple handrail along its aft edge, makes a very appealing study area. With just the three cabins, the spaces down below are pretty generous. Along with this mini-mezzanine, the full-beam master also boasts a big walk-in closet and a full-length sofa and sideboard, not to mention a 6 foot, 5 inch by 5 foot bed. Set far forward in the bow, the VIP’s double berth is necessarily raised well above what anyone who lives on land would regard as normal, but it will be easy enough to access even for those whose knees are not what they were; drawers here add useful stowage volume. The third cabin, a twin-berth on the starboard side, is small but perfectly adequate, with 6 foot, 3 inch beds, en suite access to the third head compartment and excellent headroom virtually throughout, in common with the rest of the lower deck, of 6 foot, 7 inches. 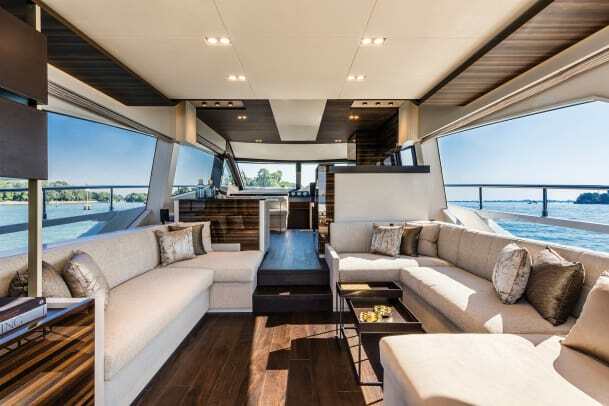 Choosing a lower deck layout is one of three big decisions on the 670’s options list. Another is whether or not you select the fixed hardtop or a roll-bar with a bimini, or neither. And the third is whether to just have the 1,000-hp engines, or go the whole nine yards. The owner of our test boat had made all the right choices, in my opinion. 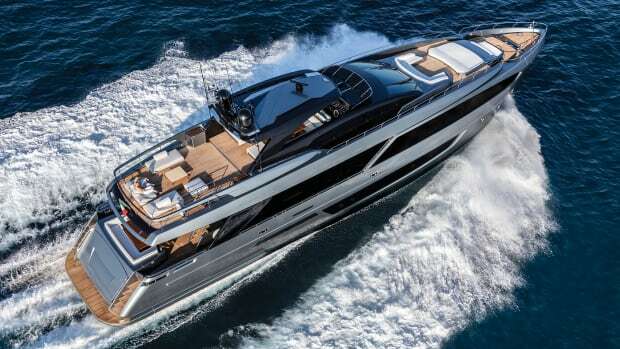 The 1,200-hp MANs provide plenty of power for this quite substantial motoryacht, which tops out at nearly 50 tons with full tanks and could easily accommodate several tons more of gear and equipment. We didn’t have a tender on board during our test, but we were carrying the weight equivalent of a 4-door SUV in the tanks, and yet the sheer grunt available from the 1,200s—maximum torque kicks in at 1200 rpm and it doesn’t let up—made the driving experience effortless and enjoyable. The slightest touch of the throttles produced a willing response at all speeds. Electro-hydraulic steering can be optimized for feel and feedback, and seemed perfectly set up on our test boat—although some owners might want a tighter turning circle. 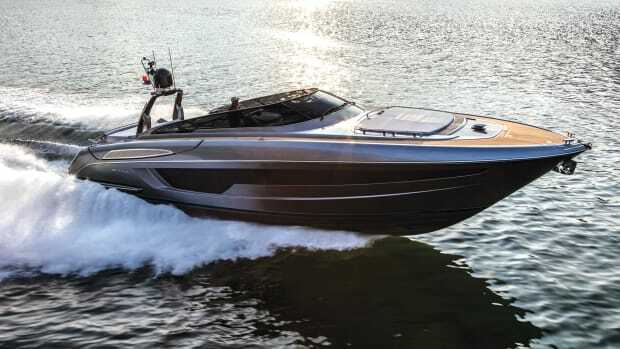 It’s not just power that creates this kind of sportsboat handling and responsiveness, of course, but also hull shape. The 670’s moderate vee sections and full bow, while providing plenty of lift and lively acceleration, did of course thump through the wakes of other yachts—the only real waves we could find that day—in a manner that was sufficiently humorless to suggest that in head seas you’d be slowing down to find a comfortable cruising speed. Downwind, the yacht behaved impeccably. The optional Xenta joystick control takes a little getting used to, but works well. 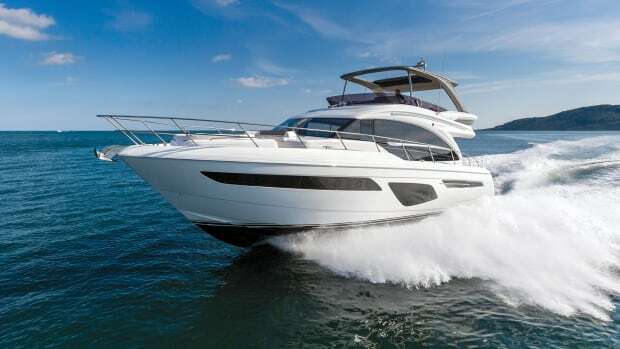 Although it can be used at speeds of up to about 28 knots—you steer by moving it side to side, input throttle commands by tipping it forward and back and override it by screaming and grabbing the manual controls—it is of most use in “Docking” mode, at a maximum engine speed of 800 rpm. Calling up the Xenta display, you can see in clear graphics exactly how much helm, throttle and thruster are being applied by your tiny twists and prods of the joystick. It’s quite educational. The high-tech credentials aboard the 670 don’t end there: The three big integrated screens at the lower helm station (two upstairs) are intended to display propulsion info, navigation and vessel monitoring. 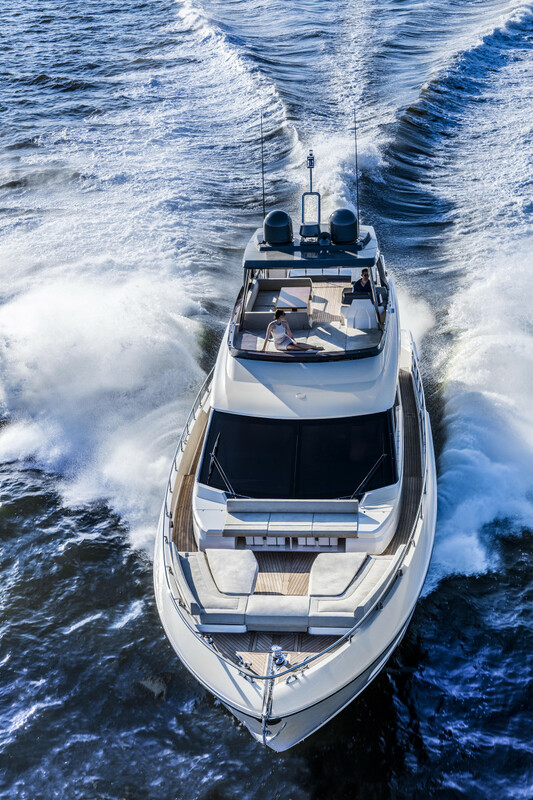 Taken together, these offer a complete view of the bigger picture, while allowing for every nuance of the yacht’s safe operation to be easily accessed, with just a single new Naviop interface for the owner to learn. This perhaps encapsulates how Ferretti likes to do things. It is not just with refinements in design, but with new technologies like these that the yacht steps further along its evolutionary line, keeping up with the demands of the modern world. And in their turn, these developments make their demands on us. We have to keep up with the yacht. But we can be sure it’ll be worth the effort. Test Conditions: Temp. : 77°F; seas: 3-4 ft.
Load: Fuel: 370 gal. ; water: 170 gal. ; safety stores only; 8 people on board. Speeds are a two-way average recorded via Simrad GPS. GPH taken via MAN engine display. Sound levels measured at the helm. 65dB(A) is the level of normal conversation. Range is based on 90% of advertised fuel capacity.